I love me some ooey gooey black mission figs & when they are nice and ripe, they truly taste like jam! 😋They are amazing for our digestive tracts, which need to be in great working order to have clear, healthy skin! Here’s some info on the benefits of figs from The Medical Medium’s book Life Changing Foods. I highly recommend this book, all of the detailed info on how powerful plant foods can be on our bodies is so amazing! If you’re seeking answers for brain & gut health, look no further than the fig. It’s the ultimate tool for balancing these two intertwined aspects of well-being. 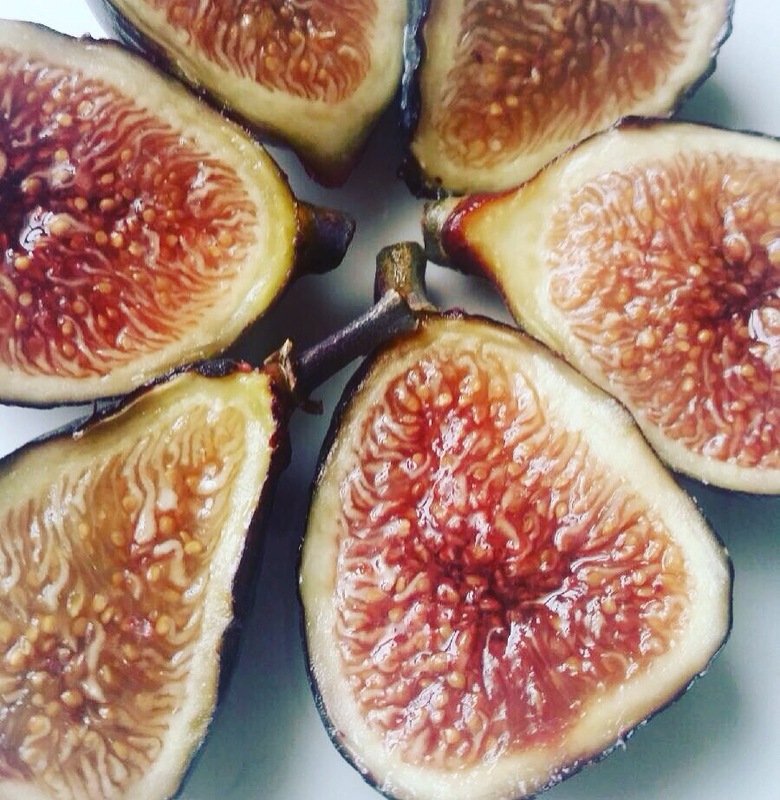 Figs have unique phytochemicals that are bonded to minerals such as bioavailable potassium & sodium that specifically nourish & build neurotransmitters while also supporting neurons & synapses in the brain. It’s a powerful fruit for preventing Alzheimer’s, Parkinson’s, dementia & other neurological diseases, including ALS. On the intestinal side, figs are, like dates, one of the most effective bowel-cleansing foods on the planet. The skins feed good gut bacteria & are also antiseptic, killing unproductive gut bacteria, parasites, mold, & toxic heavy metals, while the seeds get into intestinal crevices & destroy disease-causing bacteria, viruses, & funguses that hide in those pockets. The fruit’s pulp and fiber massage the intestinal lining & build up the digestive immune system to help you stop struggling with stomach pain and bloating. Figs are effective in alleviating all types of gut problems, including diverticulitis, appendix, inflammation, constipation, inflamed colon & complications from C.difficile. Figs are high in vitamins such as the B vitamins, which are specifically bonded to phytochemicals to reduce radiation in the body. Also abundant in trace minerals, micronutrients, antioxidants & more, figs are a wonder food for all manner of ills; they should never be overlooked. The next time you’re dealing with any health issue, think of figs as your secret weapon!